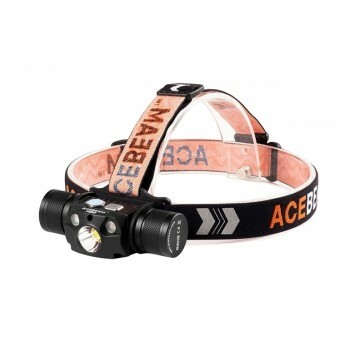 ACEBEAM H30 provides an unparalleled output from Ultra-Low 3 lumens to Turbo- max. 4000 lumens widely used from night reading to outdoor searching, making ACEBEAM H30 the most powerful headlamp. The equipped Type-C rechargeable function with Triple times charging speeds makes H30 much more convenient to charging the 21700 5100mAh battery inside the tube without taking the battery out. Being fitted with a CREE XHP70.2 LED white light for a better color rendering, the additional CREE XPE2-R2 630nm Red light and Nichia 219C 90+ CRI light allows the capability for any mission such as outdoor hunting, and easily protects the night vision. The special SOS for an emergency can even last 72 hours without turning off the light. The compact headlamp H30 is ideal for demanding sports such as hunting, fishing, cycling, camping, backpacking, reading and all night activities. *Due to heat generated the H30 will step down from 4,000 lumens to 1,000 lumens in 1.5 minutes, and 2,200 lumens to 1,000 lumens in 5.5m.